Fraudulent websites ALERT and annoying telemarkerters and scam artist. Jobseekers need to be on the lookout for spam emails such as the one below from Transworld Systems. The company makes these claims below. We suspect that there is a fees for such program. Welcome to Transworld Systems, home of Accelerator and the Profit Recovery System. We are redefining the collection agency industry by providing businesses and healthcare organizations with better tools for accounts receivable, debt recovery and past due accounts. With a success rate 4 times the industry average, Transworld has collected $6 billion over the past decade for more than 60,000 clients – from Fortune 500 companies to small businesses. We provide an opportunity that includes the freedom and flexibility to run your own business while receiving support from an established, high tech company with a 40 year history. At Transworld Systems, you join a talented team of sales professionals who whole-heartedly believe in our company and services and thrive on offering businesses and medical practices a full suite of cash flow management solutions. I sent you an email on Monday, March 10, regarding a possible career opportunity with our company in the Southern California Market. According to my notes, I haven’t heard from you and was curious if you are still seeking employment? I know, based on the people that I have talked to in my initial interviews, that what we do can be a little confusing at first and that many times candidates confuse us with a typical collection agency. We work with a wide variety of businesses and medical practices to help enhance the revenue cycle management process and we are the leader in our industry. We have NEW tools to help our clients avoid the use of a traditional collection agency, except in the most extreme cases. I am interested in scheduling a time for you to come in and talk with me to better explain what we do and how this really is a professional sales and marketing opportunity. I encourage you to be open-minded and to invest 30-40 minutes meeting with me in our office. • Monday, May 12th at 3:30 PM. larry.eddo@transworldsystems.com with your preferred time. If you are not interested or no longer seeking employment, please DO NOT reply to this email, simply delete it. If you are interested, contact us immediately at the above email address. PS: This will be my last communication with you unless you respond within the next 3 days. 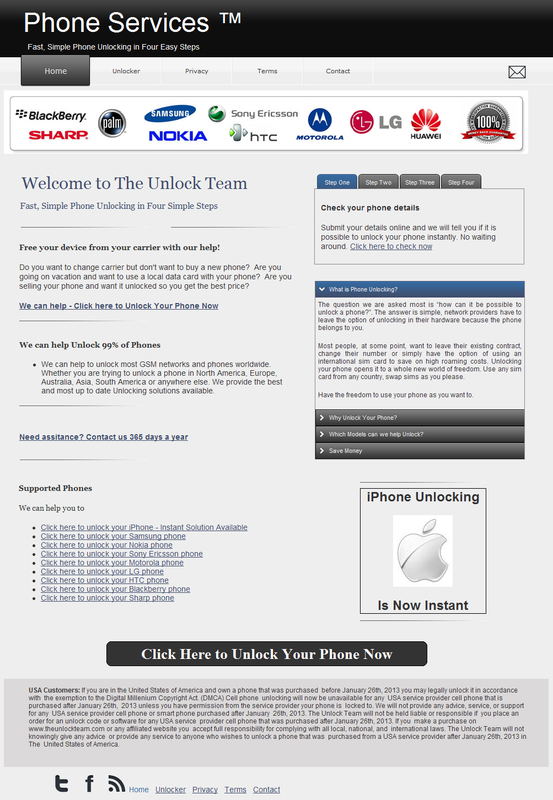 scamFRAUDalert see it appropriate to issue this ALERT as The Unlock Team dba http://www.theunlockteam.com/index.html may not be capable of unlocking your mobile or cell phones.